In the conditions when oxygen is available and redox level is moderate, the electron transport chain (ETC) of plant mitochondria reduces oxygen to water. However, when the redox level is increased, one-electron transfer to oxygen becomes more plausible and superoxide anion is formed, which is further metabolized to hydrogen peroxide, both representing reactive oxygen species (ROS). The alternative rotenone-insensitive NADH and NADPH dehydrogenases prevent the increase in redox level of NAD and NADP, while the alternative cyanide-resistant oxidase prevents the increase of redox level of ubiquinone. When oxygen is depleted, nitrite can substitute oxygen as the terminal acceptor of electrons in the mitochondrial ETC resulting in the formation of nitric oxide (NO). 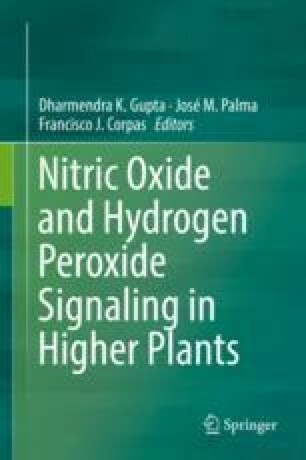 The interplay between NO and superoxide results in generation of peroxynitrite and other reactive nitrogen species (RNS). The reactions of peroxynitrite metabolism include participation of thioredoxin. The complex interaction between ROS and RNS in mitochondria results in the involvement of several regulatory mechanisms which include S-nitrosylation and tyrosine nitration of proteins and formation of S-nitrosoglutathione and its further conversion by S-nitrosoglutathione reductase and other reactions that aim to maintain the stable non-equilibrium state of mitochondrial metabolism. The balancing of ROS and RNS formation and scavenging represents an important function of plant mitochondria regulating cellular metabolism and initiating signal transduction events.